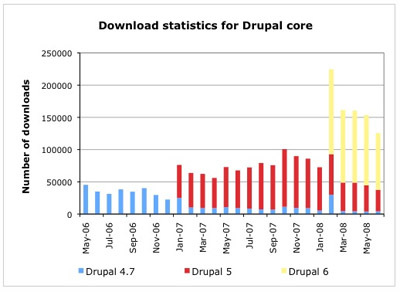 Drupal founder Dries Buytaert is out with his yearly Drupal download stats. Overall, Drupal has been downloaded 1.4 million times with Drupal 5 leading the pack. New version 6.0 is picking up the pace with more and more downloads each month. These numbers only include downloaded from Drupal’s Web site. Other download options aren’t included in the chart below.